How much notice is required for Christmas Shut down? As your trusted business advisors and accountants, we are often asked questions about leave entitlements, the effect on payroll, notice requirements for forced leave as a result of office shut down over the Christmas period and many more. We thought it timely to provide some clarity around these issues for business owners and employees. We hope the following helps and if you require more information please contact us on advice@advivo.com.au. 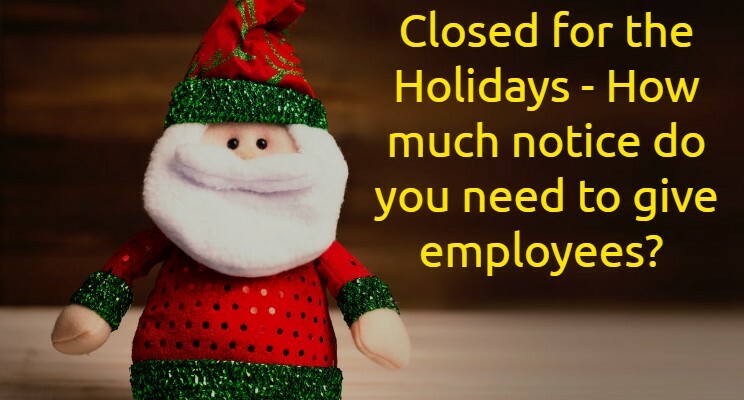 Christmas closures are common for many businesses for a variety of reasons, but they are not without their challenges. There are many rules and regulations to consider. First of all, we note all businesses in Australia must adhere to the 10 National Employment Standards (NES). This will change to be 11 when Family & Domestic Violence Leave is introduced next year. The Fair Work Amendment (Family and Domestic Violence Leave Bill 2018) passed both Houses of Parliament on 6 December 2018. This is due to become law within the next year. When considering a period of forced leave, such as a Christmas close down, there are differing notice requirements that you need to adhere to depending on your employees’ award/s. For example, for an employee governed by the Clerks – Private Sector Award 2010, you must provide a minimum of four weeks notice of the proposed close down. For an Award free employee, you may direct them to take annual leave as long as the request is reasonable as seen below from the Fair Work Act 2009. Sect 94 does not define a minimum notice period, however, we recommend a reasonable notice should be given, in reference to other applicable awards for your employees would be a good guide to reasonable. What if employees don’t have sufficient accrued leave? The general rule will be that an employee who does not have enough annual leave entitlement to span the period will be forced to use their annual leave entitlements during the period until that is exhausted. Once the annual leave entitlements have been exhausted, then the default requirement should be that the Employer will grant authorised unpaid leave and record it as such, until the conclusion of the closedown (or shutdown) period. For Award free employees, it is your discretion as to whether annual leave in advance will be granted and how much will be provided. We recommend providing this sparingly as it is notoriously difficult to recover overdrawn annual leave entitlements should the employee leave before they earn the entitlement back. For Award covered employees, the provisions of the modern award must be considered before confirming to what an employee is entitled. It is not advisable to view this generally because this is highly dependent on what the applicable modern Award provides and requires. We hope this helps and as always, we invite you to contact us if you have questions or queries as the answer may not always be directly in front of you. You can also follow us on LinkedIn for other valuable articles and information. This is also an opportune time to mention that Advivo will be closed from 5 pm Friday 21st December 2018 and re-open on Monday 7th January 2019. An Employee Keeps Calling in Sick, What Should I Do?